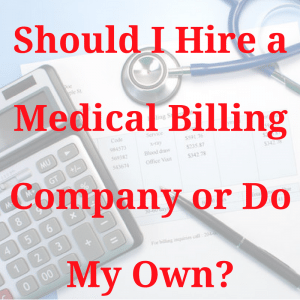 Should I Hire a Billing Company or Do My Own? For me, as an expert medical biller, this is the hardest question to answer. Medical billing has so many intricacies and learning the ins and outs is an incredible task. Simply stated, it’s learning another language. Following the list below will allow you to simply answer the question and move forward with your decision. Be sure to consult a qualified practice consultant or credentialing company for a referral to an amazing and trusted medical billing company. Have you added your group or individual practitioners to every single insurance company you plan to accept? Have you loaded each payor’s fee schedule to your medical billing software? Have you sent a test claim to every single payor and been paid? If the answer to all 3 questions is YES, you are on the right track to doing your own medical billing. If the answer to any of these questions is NO, you need to call a credentialing company ASAP to help you get started. Do you have staff capable of obtaining the patient’s benefits (i.e. copay, out of pocket, coinsurance)? If the answer is NO, you need a medical billing company. Do you have staff capable of obtaining pre-authorizations and referrals? Are you signed up with pre-authorization services such as AIM? If the answer to these questions is NO, you need a medical billing company. Do you yourself have specialized training in coding for your specialty (weekend warrior coding classes DO NOT COUNT). If the answer to these questions are NO, you likely need a medical billing company. Most physicians feel as if they are experts at coding. However, less than 5% of the physician population is proven to be able to code according to the law and the specifics of their specialty. Hiring a medical billing company can actually make you more money. Do you have a medical biller on your staff – with a proven track record – who has been billing for your specialty type for at least 5 years? If the answer is NO, I would strongly consider a hiring a medical billing company. Your denial rate is something you should be monitoring closely. You should know how to calculate a current A/R (aging report) and you should know what those numbers mean. If you do not, or your office manager does not, you should strongly consider a medical billing company. Payment posting is one of the easier things to do. As long as you have a payment poster, and you are balancing your books monthly, this is not something that will weigh heavily on your decision to hire or not hire a medical billing company. Who is currently doing your appeals? Do you know how many claims per month you are having to file appeals for, and the reason for these appeals? This is part of managing your A/R. If you don’t have a handle on your A/R you should not be doing your own billing. As always, consult a professional credentialing company or qualified practice consultant for questions regarding medical billing companies, their fees and if they’re the right fit for your practice. Cynthia Young, the CEO of STAT, which is a national billing, credentialing and practice management consultant. STAT is a U.S.-based, national provider of credentialing, payor enrollment, rate negotiation, and other credentialing related services.